There was a time when booking flights well in advance assured the best price. But with rates sky-rocketing in unpredictable patterns, one no longer knows when to cash in on the lowest fares. Fortunately, the people at Kayak in the US conducted a study with conclusive findings for those who want to strike the best bargain. Apparently, statistics prove that the best time to book a flight is precisely 21 days before the desired departure. 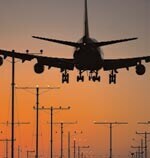 International airfare is best booked more in advance, with the lowest rates surfacing 34 days prior to departure. Another tip to keep in mind for trips that last over a week, is to travel on a Tuesday and return the Wednesday after, as the mid-week bookings result in passengers saving about 10 per cent. Continue soaring as the prices soar, just be smart about it.